One of the many everyday impossibilities of translation is rendering everything, especially someone else’s everything, the one experienced by the author. But it is possible to develop, and communicate, a feel for various registers of knowledge colliding within a work. Meanwhile Rodríguez offers a poetics of elusiveness. That which is desired, needed and pursued will always be displaced from realities at hand, before and after translation. To process the impact of displacement, the translator must turn and work in the opposite direction from everything, letting go of too much irritable reaching at information. 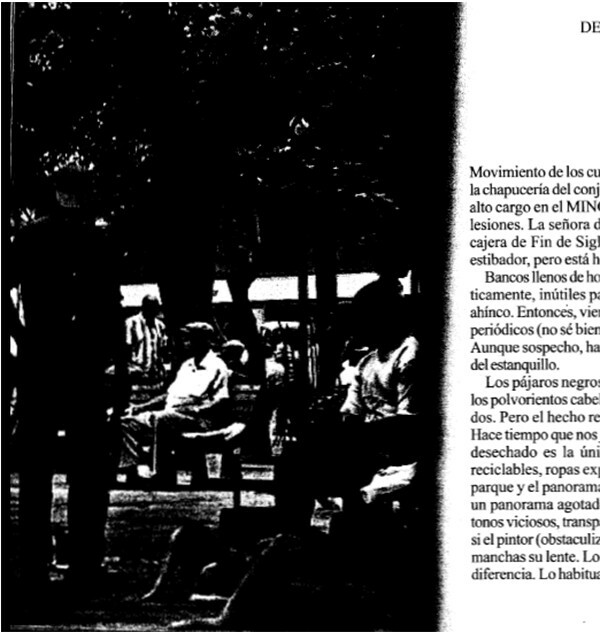 Published in 2008 by Letras Cubanas in Havana, her collection Galiano St. Variety (Variedades de Galiano) worries emergent borderlines in society. A few conventional-looking poems are here. The majority of the texts seem more like essays, or essay fragments gesturing at their own lack of full resolution, steps toward everything that necessarily fail to cover all the terrain. The texts are accompanied by photographs by Alejandro Pérez Álvarez, and these supposed documentations similarly reveal and occlude the city of Havana. The book is named after a shop, and Rodríguez turns her texts toward economic changes redefining the geometrical planes of urban psychology. These factors surface more explicitly in some texts than others. The geometries of Galiano St. Variety, more specifically, impact perceptions of belonging and nonbelonging. Her emphatically personal memories mix into passages charged with public meaning, such as buildings, streets, and parks. She observes the people who use the places she explores. While Rodríguez notes historical details, flirting with the notion of creating places for outsiders through references to tourism, hotels, and the Infotur office, her goal is different than replicating classic Caribbean distinctions between insiders v. outsiders, locals v. tourists. Rodríguez is chasing the gradual motions of social re-divide. Globalization in the present moment remaps island society under an increasingly segregated economy, while the state tries to navigate and define structural change. The magical workings of the deified Cuban state have faded in her Info office, while the potencies of currency and trade have risen. Galiano St. Variety taps into changing conversations about whether Cuba can be said to have a “public” sphere for “the people” – and if so, where to try looking for it. The writer traverses the city, registering where she can and can’t claim its space. In the entrance to a hotel where I need to pee, the porter stops me. “Why are you here, ma’am?" “You can’t go in, ma’am,” the young porter asserts. --¿Por qué tendría que explicarle a qué vengo? --No puede entrar señora, insiste el joven portero. --¡Cómo que no puedo entrar! ¿Por qué, por ser cubana? ¡Díganmelo!, quiero oírlo en su voz, ¿es por ser cubana? In another piece Rodríguez presents a tale of emotional ownership operating across the boundaries of time, not only space. She refers to her memories of Havana’s “Sloppy You” restaurant (serving Sloppy Joe sandwiches), having remarked that “nothing is left of the Sloppy, but they say the City Historian’s brigades are going to reconstruct it” (“nada ha quedado del Sloppy que ahora, dicen, van a reconstruir las brigadas del historiador de la capital,” 116). The title of the essay is “The American Club,” a building still bearing the symbols of various US states but converted into a Spanish society. More important for her is the place from which Rodríguez looks out at the club. The perspective is established from a café where her own street, Ánimas, meets a major boulevard. If the right waiter is working, it’s not hard for her to get a table. Galiano St. Variety proposes a desire for a specific capability: to able to distinguish amongst the distinct layers of personal memory comprising a city. The ideal city-construct would incorporate Havana’s public history too. Among other delineations ebbing and flowing in this book: Spanish colonial rule collides with US neocolonial rule from the early- to mid-twentieth century; again with the revolutionary state’s visions for its citizenry; and especially with whatever the contestations of the early twenty-first century now signify.